Dalí’s birthplace will be rehabilitated. Twenty years after the Figueres Town Council bought the house where Salvador Dali was born, finally it seems that the rehabilitation project to turn it into a cultural center of reference. The Ministry of Culture is willing to include a grant of 500,000 euros in the 2016 budget to begin work and the city of Figueres assume the remaining cost of the reform valued at 2,511,000. Last week the mayor of Figueres Marta Felip visited in Madrid, the Institute of Cultural Heritage, the Ministry of Education and Culture, where he met with the deputy general manager Alfonso Muñoz Cosme. The talks are the continuation of a separate interview that took place a few months ago between the mayor herself and the then Minister of Culture José Ignacio Wert and are part of an initiative that has been supported by the deputy of the PP by Concepció Veray Girona. Marta Felip expected that after the tender process may lower its cost slightly and hoped to get the involvement of the private sector through sponsorship of a club, for which he will begin a round of contacts with stakeholders in the tourism sector. In any case, it considers that the approximate cost of 1.8 million remaining is acceptable to the City Council in three years. Although the museum should then apply. The purpose of the mayor is already include a round at the 2016 investment plan to be adopted in the coming weeks. “Our goal is about the end of 2018”. Dalí’s father in 1900 rented a flat in the street Monturiol, No. 6, winning the notary in Figueres Square and moved there with his wife, who had just married. In this house a first child, also named Salvador, who died at 22 months was born. The May 11, 1904 Salvador Dali was born another, which would become the famous painter. In 1908 he was born his sister Anna Maria. The father was the notary on the ground floor and is communicated with an internal staircase to the mezzanine, where the family lived. Just above did the Matas, who had come from Argentina, with a daughter, Ursula Matas, according Eugeni d’Ors with its beauty inspired the character of The Ben Planted. And one floor up Dalí’s grandmother and a single mother sister settled, though often made life on the mezzanine sliding balcony that had a four-meter wide overlooking a large garden Abadal-Fonsdeviela family, Owners of the entire building. It was at the time a house in the adjoining garden, which blocked the view from the balcony was built, when Dalí changed housing in 1912, and moved a little further, in 10 of the Monturiol street , that Dalí dubbed the genie, because there had been born inventor of the submarine Narcís Monturiol, the poet Carles Fages de Climent, historian Alexandre Deulofeu and himself. The building, whose structure and façade have been preserved almost intact, is a work of modernist architect Josep Azemar, and is part of a set of listed buildings that have been preserved in this street. Since 1961 has a plaque recalling that Dalí was born here, placed by Mayor Ramon Guardiola. The house was owned by the Marquise de la Torre, married to the leader of the Liga, Raimon d’Abadal, and their descendants ended up selling it to the city of Figueres: first the mezzanine and ground floor (the mayor Marià Lorca, 1995) and later the rest of the block (the mayor Joan Armangué in 2000). In 2004 the rehabilitation of the facade and roof and in 2007 undertook, being mayor Santi Vila, the Minister of Housing, Carme Chacon, promised to pay reform, but since replaced the promise faded. Uses the plan developed in 2008-2010 plans to establish in the ground floor a reception area, bookshop and tour desk; on the mezzanine, rather than rebuild housing it is to recover the memory of Dalí biopic; the first floor is a space for thematic exhibitions of historical recovery of characters and elements linked to Dali Figueres; The second floor is devoted to proposals of contemporary art and culture, and the roof will be reserved for gazebo, bar and rest area. The objective is to recover a heritage building linked to the artist’s childhood and at the same time, get that million annual visitors attracted by the Dali museum have another reason to prolong their stay in the city. Almost a year after temporarily close the Comerç 24, the creative tapas restaurant with which got a star in the Michelin Guide 2008, the chef Carles Abellan finally decided to close it and prepare for the opening by early 2016, La Carles Abellan bar, in Barceloneta. Besides having raised the bar tops, paid tribute Abellán in Suculent, economic menus served in the past in Barcelona’s old taverns, and restaurant Bravo is exploring old cookbooks to recover history cuisine in town. Now is the turn of the dishes from the sea. To return to the city simple and other dishes for special occasions such as zarzuela. Internationally renowned artists as Matt Mullican, Antonio Lopez and Antoni Llena will be among the protagonists of the first edition of the Barcelona Gallery Weekend, a weekend of exhibitions, actions and interventions in spaces that will be held from October 1st to 4th. From the point of view of the artistic world gallerism, “Barcelona was very stop and had been difficult to find a consensus initiative taking, which was what the government asked us,” said Maragall. The Gallery Weekend, which includes the participation of the City of Barcelona and the Generalitat, and the support of the Ministry of Culture and the city of L’Hospitalet de Llobregat, will offer a program based on four routes galleries, institutions and unusual spaces, plus other cultural, intellectual and social initiatives. The kick-off will take place on October 1st in all spaces and galleries and curated at the MACBA, which will host the opening ceremony and open city in which attendees can see the museum exhibits until midnight. Forty spaces, including 21 galleries, collected proposals for national and international artists, both contemporary and historical art. The participating galleries show the best of their programming from internationally established artists as Matt Mullican, Antonio Lopez and Mladen Stilinovic to significant proposals such as Antoni Llena, Perejaume, Rogelio López Cuenca and Daniel G. Andújar and Francesc Ruiz, representative this year Spanish Pavilion at the Venice Biennale. In the galleries who bet on the historical avant-garde works by artists such as Joaquín Torres-García, coinciding with his retrospective at the MOMA in New York, Fausto Melotti Alberto Magnelli and in dialogue with Joan Miró, and group it shows exhibited works by Salvador Dalí Alexander Calder, Juan Gris, Julio Gonzalez, Miquel Barcelo, Antoni Miralda and Carlos Pazos. The project already has precedents in Paris, Madrid and Berlin, with the participation of DNA galleries, Ana Mas Projects, Àngels Barcelona, ​​Artur Ramon, AL34, etHALL, Balaguer, Barbie Carles Taché, Estrany-de la Mota, Joan Prats, Marc Domenech, Marlborough, Senda, Sicart / Joan Gaspar, Trama, Nogueras Blanchard, Palmadotze, ProjecteSD and Sala Dalmau. As a complementary activity, Barcelona Weekend Gallery will feature the “Compositions” program, a series of five projects commissioned for the occasion, curated by the team Latitudes (Max Andrews and Mariana Canepa Moon). Mariana Canepa reported that the selected artists are David Bestué, Dora Garcia, Jordi Mitjà, with Pere Llobera Nilausen Rasmus and Daniel Steegmann Mangrané. These artists continued Canepa, develop temporary interventions in unique venues outside the contemporary art circuit as the Freudian Field Library, the Geological Museum of the Seminary, the Umbracle the Ciutadella Park, the gardens of the Central del Raval or the old All Cosme industrial site in L’Hospitalet. They have also been implicated in museums initiative and centers like the MACBA, the MNAC, the Picasso, the Blueproject Foundation, CaixaForum, the CCCB, the Center Key Art Room, the Miró foundations, Tàpies, Vila Casas, Sunol, Arranz-Bravo and Mies van der Rohe, and La Virreina Image Center. The Roman fort, built between the IV centuries BC and AD is still visible on the walls more unexpected. The old Barcino is still visible in the streets of the city, but it is also inside some buildings. 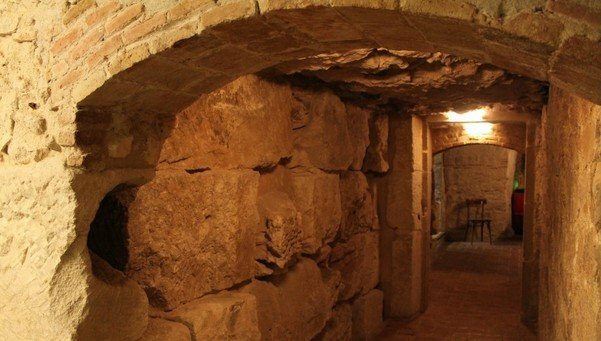 A small tour of Old Town makes time travel possible, up to 2,000 years ago, when Barcelona was a small Roman colony and strengthened through a wall that endures despite the years. Street Avignon Ramblers Association Ethnography and Folklore (AEEF) is the only place in which you can enter the wall between the fortress built in the first century BC to delimit the city and built in the fourth century AD more robust defense. In the Middle Ages it was common to make openings in the wall and remove the debris that filled the space between the two walls to expand housing. Thus, through the AEEF can access the inside of the towers 52 and 53 of the fortification and even sat with them, because there are tables, chairs and a fireplace. One of the club members, Alfred Llorea, began to crush the wall in 1957 because he suspected would find the wall. The works were finished in 1987, and currently the site can be visited on weekdays (except Thursdays) from 19 to 21 hours, making a reservation. Call street clothes shop with a sign invited to see the Roman walls. Inside the venue, just between testers and hanger, you can admire a majestic tower section. Even you can see a piece of spine, evidence that the construction of the wall pieces often took advantage of other buildings. A few feet away, on the street of New Bathrooms, cafe modernist Farm also retains a wall in the dining room at the time. The Mercer Hotel Barcelona, located in the Lledó, has the privilege of being able to enforce them meetings in a Roman tower, number 28. It is very well preserved, and often becomes a dining room. The restaurant and bar area are also flanked by the wall of the fourth century AD, and the library is based on the old walkway, linking all the towers. In fact, it is still visible very clearly the entrance to the tower number 29. The Civic Center Courtyard Lemon Street Regomir hides some remains unbeatable. Due to an expansion of the center, public baths of Barcino were revealed. The sailors and travelers they could bathe before entering the city, which acceded to the Sea Gate, also visible from the center of the exhibition hall, the Hall of Ruins. It was a step back for pedestrians has been restored as it was. Other remains have undergone changes throughout history, such as the adjacent section of the wall, where you can clearly see a fireplace. The space is managed by the Barcelona City History Museum and can be visited with the accompaniment of a volunteer who also offers historical information. Several rankings, such as Destination Europe 2015 Barcelona position as one of the ten cities preferred by big fashion brands to set up their business. “It is a very attractive city, the weather, climate and architecture, and this mainly means that there are a lot of influx of people, a key point for the brands” said Alicia Soler, expert advice and investment in expansion commercial premises. A few kilometers in the commercial centralized and closely linked to the consumption of clothing design are also some factors that make the brands that can wait a long time to find your perfect place, they decide to settle in the city. But are also attracted to creativity and innovation. “The big brands see us as a city where there is a lot of talent,” said Toni Iruela, President of Marketing Club Barcelona. After opening in 2008, American Apparel also chose Barcelona to enter the domestic market international brands such as Italian or Liu Jo store H & M, & Other Strout. 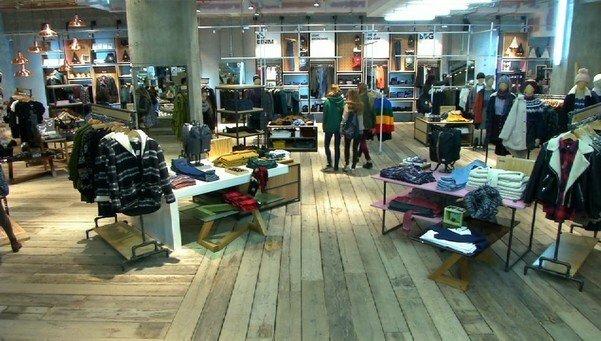 The last to do so was the American company Urban Outfitters, which adds to the Barcelona shop over Europe there are already 45 and 200 that the brand has in the United States and Canada.